We expected to be brandishing ice axes in the snows of Scafell on this meet but when we arrived in the Lake District not a flake of snow was visible even on the highest hills. It was already starting to rain but the weather forecast was good and we thought it wouldn't last long. 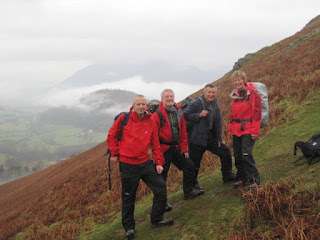 We were aiming for a new path, a mile after Bull Crag on Maiden Moor but it was going to be hard to find. It appeared to begin 100 metres after a "cairn" marked on the map shortly after a point where crags came close to the path. After passing many large cairns we noticed a faint trace and a second smaller cairn heading in the direction of Borrowdale - this had to be our path. After a while we passed a third cairn and a slope by a stream giving shelter from the wind - our dinner spot. 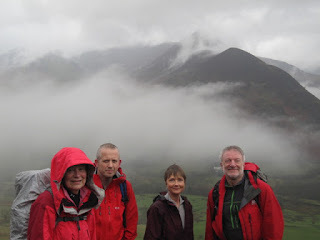 The path was still tiny but beckoned further towards Borrowdale before turning and traversing northwards by Nitting Haws towards Derwent Water. This excellent path was going to cut out any tedious road work from Grange to the start of the shore paths of the lake. It was still raining and we arrived back at the hut, soaked to the skin after our 12 mile trek, to a warm fire and a welcome cup of tea. Sunday was bright and snow had fallen on the higher hills in the night. 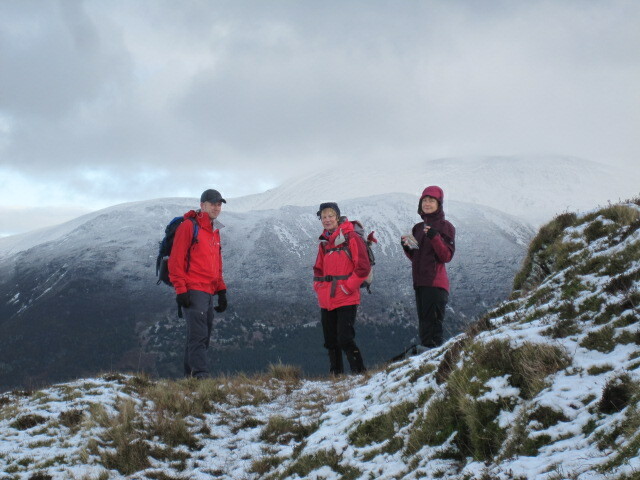 We reckoned the new snow would be treacherous on the steepest ground so opted to climb Barf overlooking Bassenthwaite Lake. Parking at Thornthwaite village we took the steep path by the "Bishop and the Clerk" emerging to snow on the summit of Barf. With wonderful views all around we wanted to stay high and walked to the summits of Lord's Seat and Broom Fell. Descent was through the forest of Winlatter and the lovely Comb Beck to our start point.